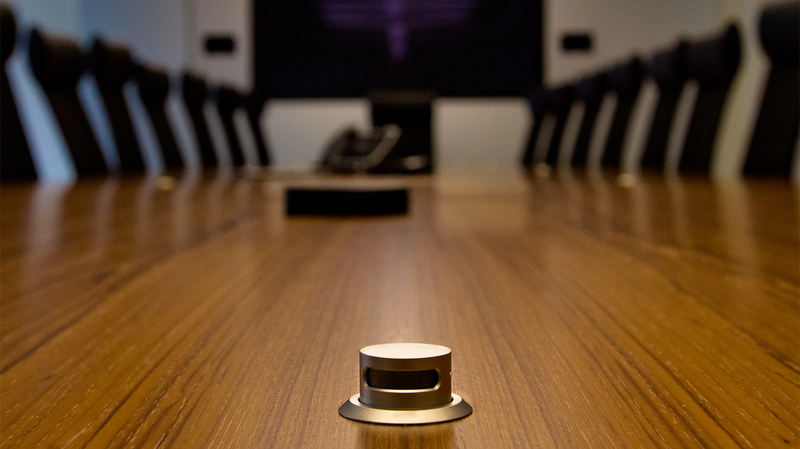 When Hudbay Minerals Inc., an international mining and mineral corporation headquartered in the heart] of Toronto’s financial district, moved to its new location, the company needed a state-of-the-art, world-class boardroom that would fit with its TSX listed corporate profile. To accomplish this, they contracted the help of premier audiovisual integrator, Design Electronics. “They wanted a simple, easy to function system featuring the highest level of performance while showcasing an extremely aesthetically pleasing and clean installation,” says Design Electronics’ President Lorne Bjorgan. Working closely with the consulting firm, interior designer, architect, and several other third-party contractors, the Design Electronics team took lead in the design, installation, and programming of the sophisticated, multi-dimensional audiovisual system. As the central corporate location for the entire company, effortless and reliable functionality of the boardroom was paramount. 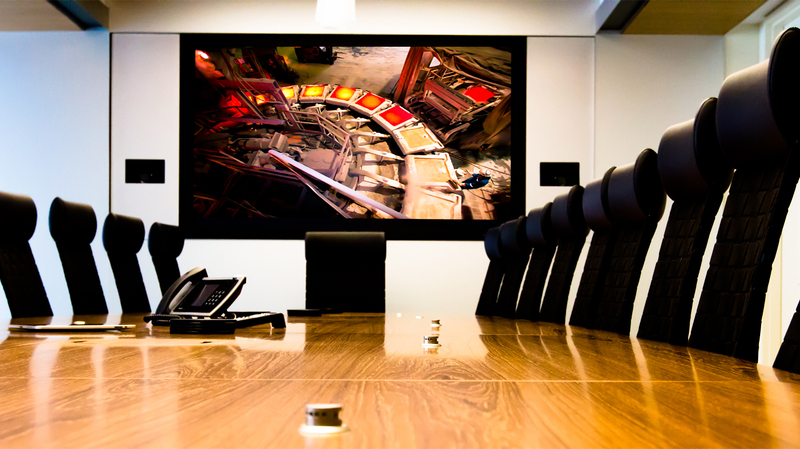 Hudbay Minerals required the boardroom to provide the capabilities to conduct multi-point videoconferencing, audio conferencing, and corporate and client presentations. The focal point of the entire system is a 103” Panasonic Plasma HDTV, a component that, as Bjorgan shares, required the Design Electronics team to carry out some innovative custom fabrication and problem solving to meet the distinct specifications provided by Hudbay Minerals. “They wanted it installed flush into a custom-designed wall-unit cabinet that offered shelving and doors,” notes Bjorgan, while adding that mounting such a large screen, which weighs in at 485 lbs, was no easy task. Since nothing available on the market would suffice in properly supporting the screen, Design Electronics’ in-house design and fabrication team custom manufactured a heavy-duty articulating mount that offered pinpoint accurate placement of the screen within the wall-unit. The custom mount provides a flush and seamless solution while also offering convenient rearaccess in case of any required servicing. At the brains of the operation is a custom-programmed Crestron control system, which provides one-touch functionality and control over every component of the system. With two full-time Crestron Certified programmers on staff, as well as three additional trained Crestron programmers, Design Electronics can offer clients the industry’s most qualified team of programmers available. 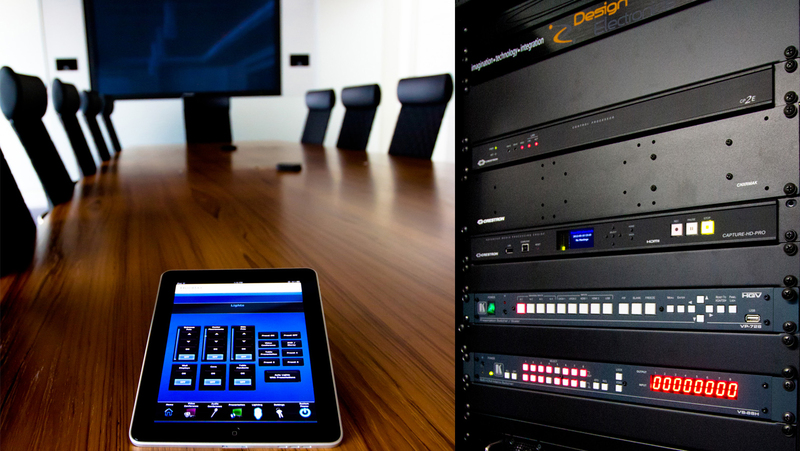 Employing a touch-screen, wall-mount interface as well as a wireless Apple iPad interface, users of the boardroom are able to cue preset automation as well as individually adjust audio, lighting, microphone, and televisual levels. “Hudbay executives can touch one button and the screen turns on, the blinds close, the lights dim, and the video and microphone systems turn on to preset levels,” explains Bjorgan, of just one of the programmed automated cues integrated into the system.